Around third grade children come into my library asking for books about inventions. Crayons, tires, chocolate, cotton balls, you name it, they ask for it. 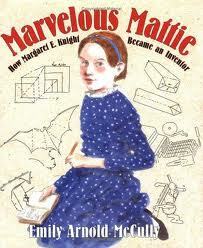 Now there is another book about inventors to add to this popular collection. In The Bag by Monica Kulling’s is an entry in Tundra’s Great Idea Series. This lively picture book biography follows Margaret Knight, the woman who designed the machine that made square bottom paper bags. 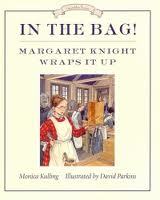 The year 1868 found Margaret, now thirty years old, working in a paper bag factory, where paper bags were folded by hand. One day Margaret wondered if she could design a machine that would make a paper bag with a flat bottom. “That night, Margaret began designing a machine that would cut, fold, and paste a flat-bottom bag.” Her persistence paid off. After two years Margaret had a prototype that worked perfectly. Unfortunately, upon registering it for a patent, it was discovered that someone else, a Charles Annan had already registered the same design. Not to be detoured, armed with her notebook and diary, the feisty and confident Margaret won her case. In 1870 she filed for her first patent. Complimenting the text are David Parkins illustrations done in pen and ink with watercolor on paper. His sepia tones and careful attention to period details will engage readers. An author’s note and a short bibliography (sources of inspiration) is included. This books are great for kids. It also help them to develop their creativity and the same time they enjoy while doing these things.